Digipath: Operational Improvement, Low Market-Cap | Marketfy or install Google Chrome Frame to experience this site. 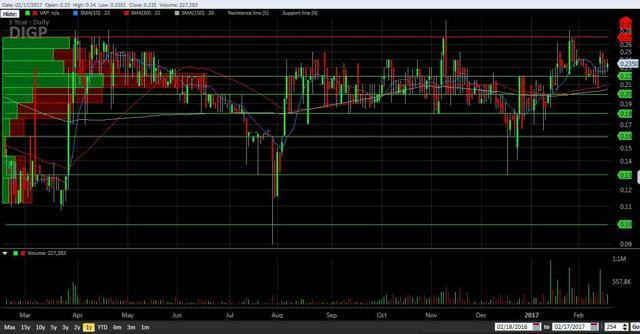 Digipath (DIGP) is a publicly-traded cannabis company focused on lab testing, with an initial focus on Nevada. With a market cap of less than $10mm, a clean balance sheet and substantial revenue growth, the stock stands out among the sector. Dr. Orser draws from over 20 years of experience innovating in both academia and private industry. She holds 18 issued patents and has authored 41 peer-reviewed publications. She received her BS in Botany from Montana State University in Bozeman, and was awarded a PhD from the University of California, Berkeley, in Plant Pathology and Genetics. Dr. Orser is the founder of five biotech companies including Adlyfe, Cellphire, Big Sky Biosystems, ASDx Biosystems, and iPDx Biosciences. She has consulted for the molecular and medical diagnostics industry as well as the federal government. For five years, Dr. Orser served as Corporate Senior Scientist and Head of the Biodefense/ Biotechnology Initiative at Areté Associates in Washington, DC, and she was also a tenured professor of biochemistry and bacteriology at the University of Idaho. 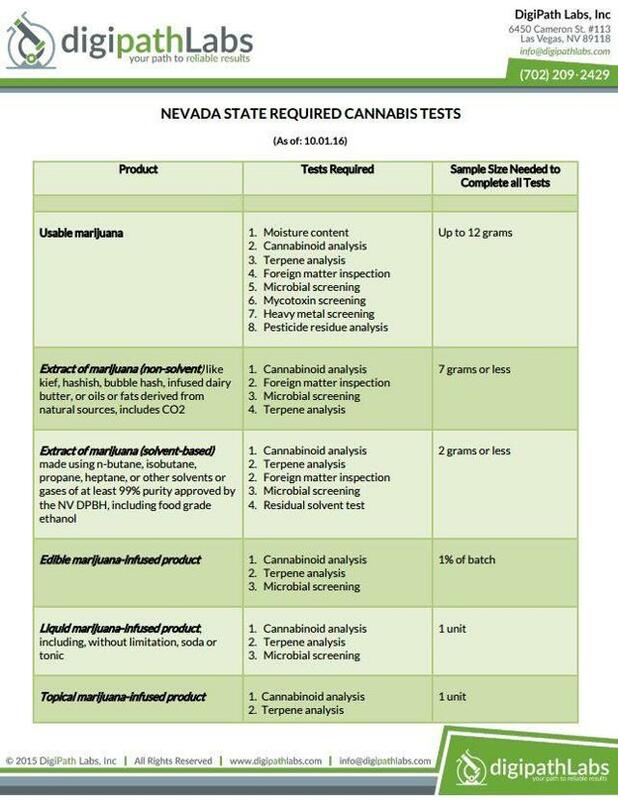 Digipath appears to have an early leadership position in Nevada, which is strictly "medical" at present but which will soon transition to legal for adult use. The company has plans to expand. Earlier this year, it announced a pending acquisition of two mainstream labs in New Jersey/Pennsylvania, and it expects over time to convert these to cannabis testing labs. It also has indicated its desire to license its IP. The company reported 27.34mm shares outstanding as of 2/10. It also had 3.02mm Series A convertible preferred shares at 12/31, but subsequent conversions indicate that there are 2.55mm (which convert to 12.75mm shares. The sharecount, then, is 40.09mm before considering options and warrants. At 12/31, there were 9.29mm options outstanding and 4.1mm warrants. The options have an average exercise price of .23 (minimum of .181), while the warrants have an average exercise price of .29 (minimum of .1901). The exercise of warrants or options would improve the balance sheet, which at present shows tangible equity in excess of $1mm and no debt. FY17-Q1 sales grew 32% sequentially and 300% from a year ago. Gross margin improved dramatically, operating losses fell to $283K compared to $532K last quarter and $827K a year ago and operating cash flow was positive for the second consecutive quarter. At $0.235, the market cap is just $9.4mm. 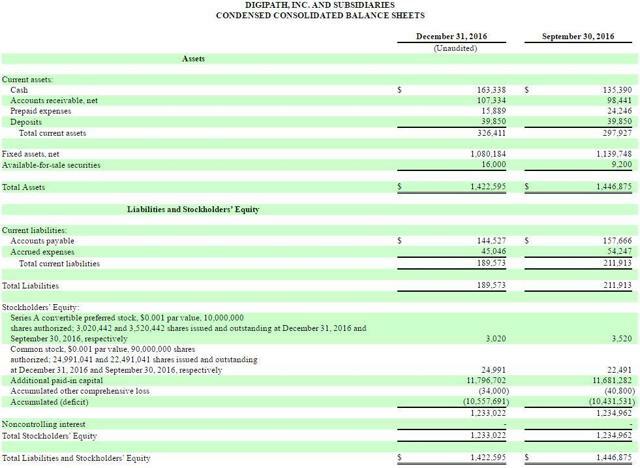 The trailing sales of $1.1mm give it a P/S ratio of 8.34X, which is relatively low for cannabis stocks with sales (especially considering that cash flow is positive). The closest peer is Signal Bay (OTCPK:SGBY), which hasn't yet filed its 10-K for the year ending 9/30 or the 10-Q for the quarter ending 12/31. The diluted sharecount, not including floorless convertible notes, is likely 2 billion, suggesting a market cap of about $46mm at the recent price of $0.023. 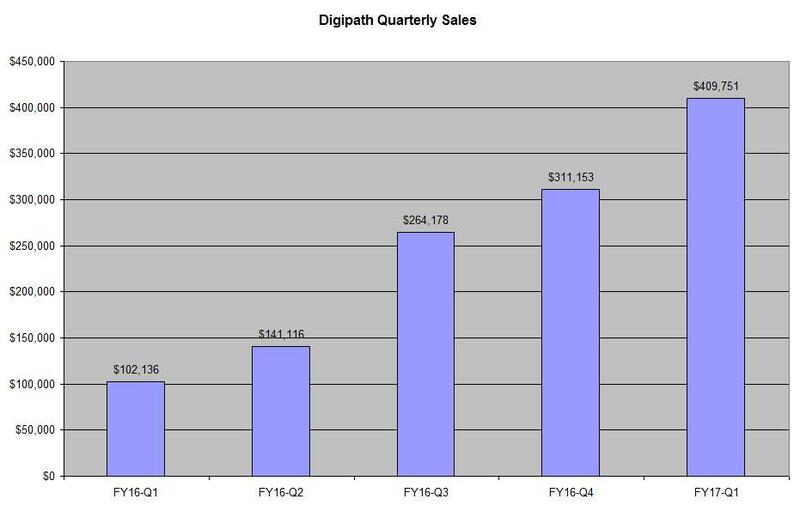 Digipath has strong revenue growth, a decent balance sheet, a low valuation compared to other cannabis stocks and is poised to benefit from the continued growth in the Nevada medical cannabis market as well as its full legalization with the potential to expand into other markets.